My family knows Thanksgiving. It’s our holiday: an extended family affair, with tables of food and nearly a case of wine. Everyone seems to end up in heartfelt, jubilant conversations. It’s my favorite way to spend time with my favorite people: cooking, eating, talking, connecting. In my twenties, I spent the holiday with a different part of the family. I couldn’t wait for the boozey, reckless time I’d come to expect. But as the day unfolded, it was clear that this was something else: something quieter, less comfortable, more reserved. No matter. We’d get to the food and the wine, and the conversation would come. Once dinner was served, I sat down between a family friend’s aunt and uncle. The dishes began to make their way around the table, and I helped myself to a spoonful of mashed potatoes. You should start with the salad, said the friend’s aunt. And maybe finish with the salad! Just salad for you. She laughed, taking the bowl from my hands. My face flushed red, and I could feel myself recede beneath my skin. I felt so small and so big, cumbersome, unwieldy, all at the same time. I couldn’t seem to gather my thoughts, make my eyes focus, bring myself back to the conversation at hand. When I finally came to, I realized that other people at the table had taken notice. They were laughing. I didn’t know what to do. I felt certain for a moment that I couldn’t move. When I tested my legs and realized I could, I got up and went for a walk in the rain. I came back a few minutes later, but found myself struggling to participate. The rest of the evening is hazy now, both with emotion and time.I’m not entirely sure how I spent the rest of the night. I imagine I was terrible company. I’m not generally a crier, but when I got home that night, I did. I cried for the comment, and all the others like it. For the laughter, and the readiness with which it came. For the sidelong glances, and the judgments beneath them.They came out in waves, these floodwaters of grief. For all the love and connection I’d gotten from my usual Thanksgiving, I got just as much in alienation from this one. Food-centered holidays are a tough time for all of us. We find time to reconnect with family & loved ones over food. We cook for one another to show affection, generosity, gratitude. We eat together to find connection, to nourish each other. And amidst all that cooking and eating, we are reminded of the bodies we don’t have, symbols of the lives we don’t lead. We greet our own bodies as revelations of our own perceived weaknesses. So we loose all that insecurity in caveats — little comments to let those around us know that eating this way is an exception, not a rule. We remind those around us that our commitment, our fortitude, our stoic resistance to temptation is stronger than this. Today is unusual, we tell ourselves aloud. I’m so bad. I won’t eat for a week. I’ll have to spend a month at the gym. Sometimes those comments turn outward, showing up as anxious questions and unsolicited advice. Are you going to eat all of that? I think you’ve had enough.Alternate bites of food with sips of water. At the precise moment of abundance and connection, we focus on lack. We feel pressured to acknowledge that our bodies aren’t what we expected. Our new year’s resolutions came up short. We haven’t shrunk enough, haven’t shown the discipline we think we ought to. These little missives are pleas for forgiveness, preemptive strikes against the silent critiques we expect from those around us. In that way, comments about food are a performance: a scripted moment of humility, designed to pardon us for our indulgences and perceived shortcomings. We assign moral value to food, then self-flagellate for our lack of piety. Often unintentionally, we create a hierarchy of bodies, assuming that our devotion is visible in the shapes and sizes of our skin. Who has kept the faith? Who needs to confess? At a holiday all about food, we apologize for eating. At the precise moment we carve out to connect with one another, we distance ourselves. At that Thanksgiving, years ago, I took that comment hard. I still longed for a thinner body, believing it would bring with it a career, a partner, an uninterrupted happiness. Despite always having been fat, I believed that my body was a sign of weakness, its wide skin shaped by weak hands. I didn’t treat it with tenderness. After all, it had always been welcomed brutally by those around me. Now, years later, with better tools and a sturdier sense of self, I respond differently. But comments like these, whether they’re directed inward or outward, still sting. They’re reminders of the ways, subtle and overt, that those around me judge my body and their own. Comments like those rank everyone in the room, making us products of an assessment system none of us created. None of us benefit from it. Still, most of us perpetuate it. Family holidays aren’t always comfortable. We connect across challenging family histories, political differences, gender identities, sexual orientations. We struggle to reconcile our individual growth on such different paths with the lives we once led together. We don’t always see eye-to-eye. It can be hard to find kindness in all that. But there’s no need to make it harder with judgments we can all set aside. But more than that, remember that we’re here to look out for one another.We’re here to care for each other, as imperfect as that love may be. Act as if both of our bodies are worth loving, or at least leaving undisturbed. Learn to find your deepest love for both of us. Lay down your arms. Model the love you wish you saw around you. Model the love you need. Like this piece? 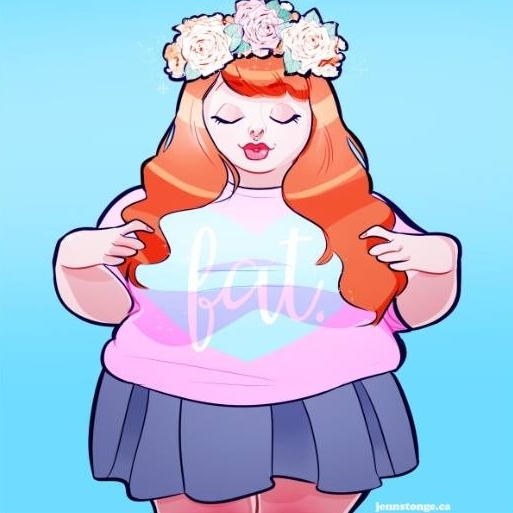 There are more like it, including “She’s not even that fat!” But I am. and On “tough love” and your fat friend’s health. You can also support Your Fat Friend on Patreon.